The first European airport sensory room developed for children and adults with neurodevelopmental challenges, including autism, was officially opened today at Shannon Airport. Ireland, 2017-Apr-02 — /Travel PR News/ — In the latest in a long list of aviation firsts on a global, European and national scale developed at Shannon, the sensory room off the airport’s Departure Lounge will offer a relaxing environment for passengers ahead of their flight. Designed by Adam & Friends, it is tailored to be a soothing place away from the activity of a busy airport and comprises facilities such as aquatic bubble tube, an undulated wavy wall, colour changing LED’s, wheel projector and other items. As an event itself, the official opening of the room was a show of support for people with autism ahead of World Autism Day on April 2nd next. Among the attendees were RTE personality Marty Morrissey, Shannon Group Chairman Rose Hynes, Shannon Group CEO Matthew Thomas, board members and staff. 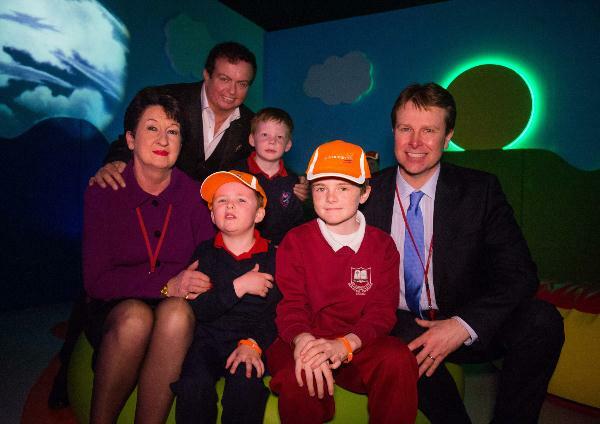 The investment in the sensory room follows another international airport landmark initiative at Shannon last year when it introduced a customer care programme for people with autism and special needs. Customers who need additional support can now avail of official caps and wristbands at Shannon to ensure that they are immediately identified by staff and receive the special treatment they deserve, including being now brought to the sensory room. At the official opening of the Shannon Airport sensory room today, Niall Maloney, Director of Operations at Shannon Airport, urged other Irish and international airports to get on board to standardise this service at all European airports, reciprocate this service for our passengers in a similar fashion on their return flight and look to provide similar facilities. “I’m both delighted and proud that an Irish airport, Shannon Airport, is the first to introduce a sensory room in Europe. It’s in keeping with Shannon’s special reputation for looking after its passengers. The introduction last year of its hats and wristbands programme and the addition this year of the sensory room is our way of showing our support for our customers with autism and special needs. I would dearly love it if other airports around Ireland and the world participated in this. “It’s one thing for Shannon to put these provisions in place but if all other airports participated in this programme so that when the passenger arrives on the other side, they also get special treatment, then that would be a huge gift to people with special needs and their families,” he said. Said Rose Hynes, Chairman Shannon Group: “We know that, for some of our families and individual passengers, air travel and moving through an airport environment –whether it’s dealing with check in, security or boarding – can be a daunting experience. “Our staff recognised that Autism has a profound effect on those with the condition and their families – and our job in Shannon is to deliver on our promise that Shannon really is easier to use than other airports. It is this strong sense of commitment and community which inspired our staff to develop and launch the airport’s Autism and Special Needs Awareness Programme last year – and it is that same sense of commitment to community that motivated them to develop Europe’s first airport sensory room. “Being the first airport in Europe to develop a sensory room – is in keeping with Shannon’s culture of willingness to do new things. We go further than others to create a positive experience for our passengers – particularly those who need special attention. The Autism programme is a natural extension of the Airport’s focus on customer care. We have already invested over €3 million in upgrades to our terminal building to improve the passenger experience- and this work is continuing. Positive customer experience is important to us – and customer loyalty is very important to us.” Details on the Airport’s assistance programme for passengers with autism and special needs are available at Passengers with Autism and Special Needs. This entry was posted in Airports, Flights, Hospitality, Tour Operators, Tourism, Transportation, Travel, Travel & Kids, Travel Marketing, Travel Services, Travel Tips & Info, Travelers, Trips and tagged Adam & Friends, autism, European airport, Marty Morrissey, Matthew Thomas, neurodevelopmental, Niall Maloney, Rose Hynes, Shannon Airport. Bookmark the permalink.